A multi-part story? In MY Sonic Boom comic?? You got that right! It’s wacky-racin’ adventure in “Everybody’s Super Sonic Racing” Part Two: Dr. Eggman’s fun and “friendly” go-kart challenge has turned deadly! But, really, who didn’t see that “twist” coming? Can Sonic salvage the race and prove to the bad doctor he can win fair and square? More importantly—can Sonic survive long enough to return to the race course?! Discover the fate of life, limb and ego in this super-fast story with cover art from Sonic comic fav Jamal Peppers, and an all-new “insubordination” variant cover from painter Erik Ly! …And BOOM goes the dynamite! Art: Patrick “Spaz” Spaziante, Ben Bates, Tracy Yardley, Erik Ly, Jerry Gaylord, Brent McCarthy and more! 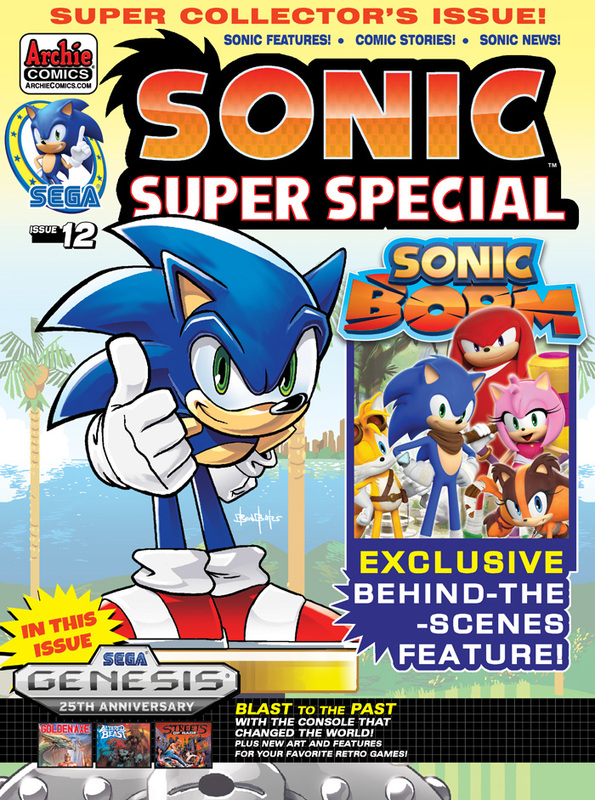 Celebrate 25 years of the SEGA GENESIS with this extra-special anniversary edition of SONIC SUPER SPECIAL MAGAZINE! Take a look back at the SEGA system that started a revolution with this anniversary issue featuring the origins of such hit games as Golden Axe, Altered Beast, Streets of Rage and more—alongside awesome new pin-up art from the Archie team! Also featured is a special look at the all-new SONIC BOOM games and TV show, with exclusive info you won’t find anywhere else! The SONIC SUPER SPECIAL MAGAZINE gives you the world of Sonic the Hedgehog comics as you’ve never seen it before, with tons of comic stories, special features and exclusive articles on the latest and greatest in the world of everyone’s favorite blue hedgehog-hero! Plus an interview with Sonic artist supreme Jon Gray and an all-new foil-enhanced cover from the incomparable BEN BATES! This issue is jam-packed with awesomeness!